A tour of the IART String Characteristics database. A video introduction to the Reviews section of the IART website. An overview of the IART website community and features. This is a great video detailing much of the important information on the Babolat Star III, Star 4 & RDC machines. Everything from calibration to proper set-up is covered. Opening up the next to the last main when the mains end at the throat can not only improve the aesthetics of the string job, it can also prevent a lot of headaches with blocked holes. 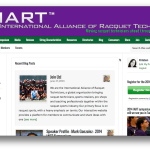 We want to thank the JRSA (Japanese Racquet Stringers Association) for their cooperation in making this video available to IART members.